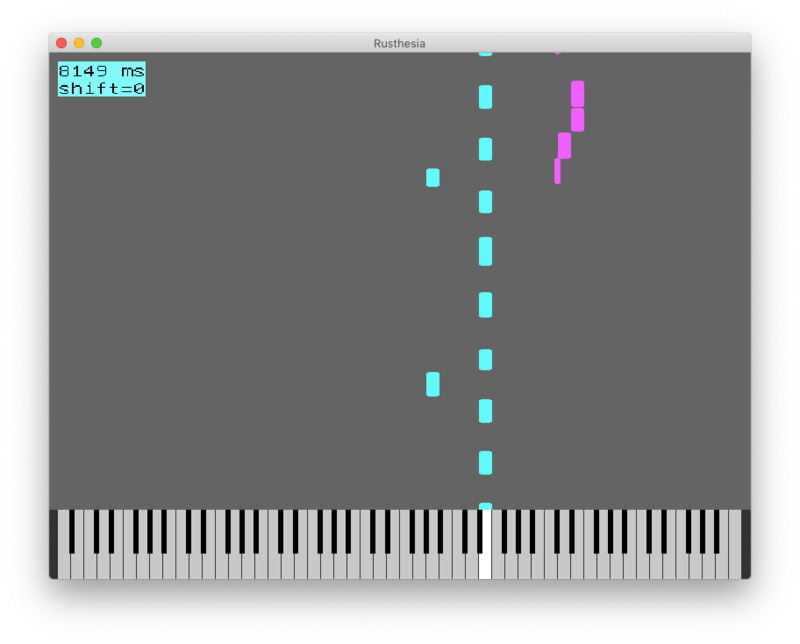 Rusthesia is till now just a hack to play a midi file, created from Logic Pro/X, and display a window with falling notes down onto a piano. The midi file can be transposed in half notes in realtime by using shift left/right key. Playing can be paused by space. Synthesizer is not included. Instead midi messages will be sent via core audio. Logic Pro/X can be used for playing the midi, but has to be set up accordingly. No idea for other operation systems, if it works or how to do. As an example the midi-file Marche_aux_Flambeaux.mid is included. As per that website, this file is in the public domain. Have not been able to use Logic Pro/X as a synthesizer with channels assigned to different instruments. Still keep looking for the needed hidden feature. Works, but need to create a concert with keyboard per channel, which is not very convenient. As rusthesia offered to use my Roland RD-64 as output, I have given it a try. Very positively surprised, that it works pretty well. Even can play along by hand to the song. No need to change a single line of code or configuration whatsoever. One only need to install the libsdl2-dev and libsd2-gfx-dev packages for your project to build. And then to install a system wide midi sequencer such as timidity and run it (using timidity -iA) to get music being played. If there is no output, then crate servo-fontconfig-sys will build its own version, which can be incompatible. Installation of libconfig1-dev has fixed this. The attached LICENSE file defines the license for the code of this crate only - specifically before compiling or linking. The resulting binary after linking may be problematic in regard to license incompatibilities of included crates. Consequently automated builds resulting in a public available binary cannot be set up for now.